This elegant Pink Papered son of BWBS Graded Stallion Wadacre Chicko is a breathtakingly beautiful horse with tremendous paces and an exquisite head. He is short coupled with natural elevation, cadence and outstanding good looks. He gives an overall picture of incredible beauty proving to be a natural performer excelling throughout all stages of his dressage career. He produces quality stock, which are easily trainable with kind temperaments. He has a predominantly bay gene and has never thrown chestnut. Chester is really bred in the purple, his relations include top level international showjumping stallions Ramiro Z , Lady Killer, Galanthus, Rastell , Raimondo, and the famous olympic mare Ratina Z gold medal winner at WEG 1994. . Wadacre Chicko, was a graded BWBS Stallion and advanced dressage horse by Atlantus (who was a legend in his own life time being sire of more graded Stallions and medal winning Mares than any other BWBS Stallion). Annika was a BWBS graded Danish warm blood Mare dam of the highest priced yearling at the High Performance Sales in 1993. Rum Moss is the dam of graded Stallions, top class competition horses including Asslam member of the Italian Showjumping team, his pedigree also includes Quorum, sire of three times Grand National Winner Red Rum . Wadacre Chicko, a graded British Warmblood Stallion by Atlantus (who is a legend in his own life time being sire of more graded Stallions and medal winning Mares than any other Stallion) is an advanced dressage horse. 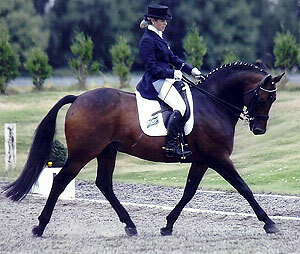 Annika is a graded Danish warmblood Mare and is dam of highest priced yearling at the high performance sales in 1993. Rum Moss is the dam of graded Stallions and Asslam, member of the Italian Showjumping team his pedigree also includes Quorum, sire of three times Grand National Winner Red Rum. During his career Chester has qualified for the four year old Potential International Dressage Horse final at the National Championships, and while competing consistently qualified for the winter and summer semi-finals from novice to medium. 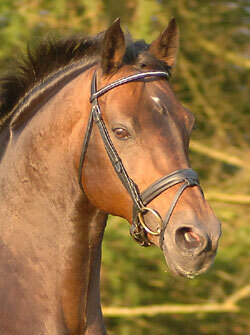 He was ranked 5th Summer 2000 and 3rd Winter 2001 Young Dressage Sire Rankings with The British Horse Database. He is graded medium and has won 12 times at this level amassing over 250 points and is working at advanced level. 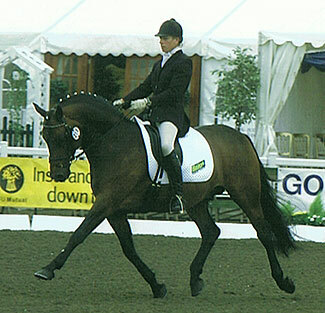 September 2002 he came 7th in the Medium Final at The National Dressage Championships ridden by event rider Andrea Morris. In 2003 he spent the summer competing with British Junior Team member Holly Doyle at the Addington and Sheepgate under 21 championships, he was placed in the junior team trial and was 2nd in the team event at Addington under 21's championships. He is a graded lifetime Sports Pony Stallion and in 2008 he was awarded a certificate of excellence by the SPSS for the most progeny to be registered with them by any SPSS stallion. Chester is 'The Face' of Baileys Horse Feeds and can be seen on many of their advertising merchandise. 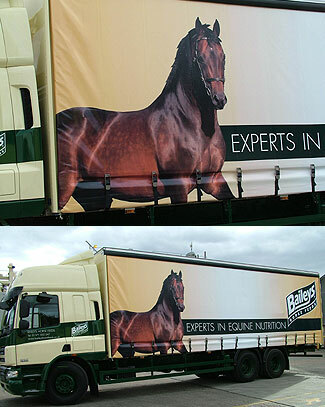 He has achieved nationwide exposure as his portrait features on the new Baileys Horse Feeds delivery Lorries. He also continues to star alongside other End House Stallions in many of Baileys advertising and packaging. He also models for Matchmakers International advertising Masta and Caldene Rugs and stars with Emma Dewhurst in the Tottie Horse wear range. He was also selected as a member of the Supporters Of British Breeding Dressage Quadrille at the Young Riders European Championships opening ceremony held at Hartpury College. Chester shows a huge careful jump over coloured poles, is completely at home across country and the only time he was shown in hand as a youngster he qualified for the Royal International Horse Show. In summer 2008 after several years away from competition due to his busy stud commitments he returned triumphant from the Northern Horse show winning the Riding Horse Stallion class, qualifying for both the BSHA National Championships, & the NPS Ottergayle Supreme In Hand Riding Horse Championship, at fifteen years of age this is surely a testament to his soundness, temperament and breeding. The Combination of Danish warm blood, Holstein and Thoroughbred gives him quality presence and athleticism. He is producing quality stock with fantastic paces. His progeny are from a wide range of mares from 11.2Hh riding ponies to 17Hh warm bloods consistently injecting quality, superb temperament and that 'look at me'. To breed top class competition/show horses is one thing but the ability to produce sensible and trainable ponies which can easily be handled and competed by children must be a real testament to this stallions lovely nature. Progeny includes Chester's Cloudy Bay - winner of SHP breeding NCPA autumn 1998, Parkgate Royal Visit won PB Welsh foal Royal Lancs, 1st and Reserve Champion Yearling-Chipping 2007, 1st & Champion Light Horse Goosenargh & Longridge, 1st 148cm Riding Pony & 2nd Performance Pony Scottish Horse Show, 1st & Champion - Sports Horse / Pony - NPS Area 5 - north West Championships 1st & Reserve Champion - Hunter Pony Breeding - Winning NPS Silver Medal, - NPS Area 5 - north West Championships 1st - 2 /3 yr. old Part Bred Arab - Royal Highland Show. At the Royal London Show 2009 - Champion Show Hunter Pony Breeding NPS Area 4 Summer Show, Overall 4th Highest placed Hunter Pony Northern Breeders Final NPS Area 4 Summer Show, 1st Youngstock (Light Horse) 1st Hack Youngstock, 1st PBA Youngstock. Springtime Breeze, Bushburn Aramist Champion ridden and supreme Champion in hand PBA . Bowland Whispering Lady (15hh) and Sir Guy of Gisburne (14hh) top class pony club/all-round competition pony, won at Novice and Prelim level dressage qualifying for the Bluechip finals and is about to start elementary level. Qualified in 2007/2008 for Bluechip, FOC, Trailblazers 2nd rounds and Champions of great britain in showjumping. and Uk Showing in Show hunters and equitation and was in the top ten in both his classes at FOC.. He also Qualified Ponies uk in WHP Champs and has done 2 ODE's coming 2nd and 5th. Aimbry Kymmara 2 & 3 yr champion at NCPA Pony Of The Year 2004, described by Horse and Hound as 'A quality youngster'. Winner Cheshire County 2006. Champion Ridden Pony Of The Year Show 2006. won novice SRT Area 2 BSPS, 1st novice SRT Cheshire County 2006, Brown Turner Award RH/Hack Overall Champion NCPA 2006. 1st Small Intermediate Show Riding Type North and East Yorkshire County Show. Qualified RIHS 2009 1st and Reserve Champion Intermediate Show Riding Type Stithians Show (Cornwall) Qualified HOYS 2009 7th Small Intermediate Show Riding Type Horse of the Year Show 2009. Qualified HOYS 2010. 3rd HOYS 201. Paddocklow Persephone Supreme Foal Cheshire NCPA, winner at North of England Show 2004, best Anglo Foal, Anglo and Part Breed National Championships, Yearling Champion PUK. Aramist Classical Echo NCPA Maelor Champion Foal. Paddocklow Supernova - Derbyshire Festival of Showing 2007, 1st Part Bred Arab Foal, 1st Hunter Pony Foal. Red Rose County, 1st PBA foal, 1st SHP foal and 1st Riding Horse Foal, Baileys Futurity Top Pony Foal, NCPA Maelor 1st Hack./Riding Horse foal. British National Foal Show-1st and Reserve Champion small riding horse, 1st and Champion 153cm Show Hunter Pony. Monte - Dressage Horse. 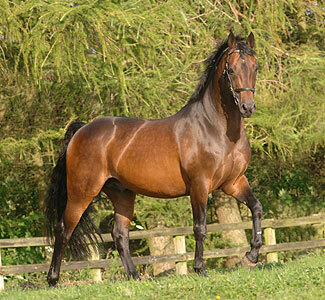 Tuell Good Resolution awarded 1st premium Baileys Horse feeds British breeding futurity 2007. Sweet Gemini PBA In hand winner and Reserve Champion, Qualified NCPA 2008 and Dressage pony scoring 70% in its tests. Burgundy's Dream Warrior 3rd Osbaldeston Sports Horse and 6th Great Yorkshire Hunter Foal, 1st Halifax and 2nd Penistone. Shuvais Taurean Free Spirit 1st and Ridden Champion PBA Royal Lancs, PUK 2nd and Reserve Champion Ridden PBA, Cherif Championships 4th PBA 153-158cms and Amateur Champion.2008 1st & Champion Part Bred Arabs (qualified RIHS), 2nd Large Hacks, 1st Large Intermediates & Reserve Champion (Qualified RIHS). qualified HOYS 2008. 2009 qualifies twice for RIHS. Savannah's Mirror Image Champion foal 07 and 5th KWPN foal show 07. Warford Saskatchewan head studbook and Reserve champion SPSS grading 07. 1st Premium BEF Futurity and Reserve champion SPSS grading 07. 1st Premium SPSS Futurity. Miss Money Penny 1st Riding Pony yearling-Cheshire County, awarded BEF 1 st premium 07 & 08 & 09,champion broodmare at SPSS grading 2008 achieving SPSS first Premium. Moaning Myrtle Intermediate Eventer ridden & produced by Andrea Johnson, BSJA winnings £500. Royalist of Crimson Royal Lancs. 08 1st Show Hunter NCPA Maelor Foal Show 1st Welsh Part Bred, 1st SHP 1st Hack Riding Foal Reserve Champion Youngstock, British National Foal Show 1st and Champion Sports Pony 1st and Champion Welsh Part Bred 1st and Reserve Champion Show Riding Pony. Royal London 09 1st SHP 1st Reserve Champion light horse of Great Britain. SPSS 1st Premium 09. Harbour Diamond Girl (Mullens Malibu) BSJA Showjumper winnings aprox. £300 jumping double clear newcomers and foxhunter, qualified Welsh Masters. Imperial High Command 2010 Reserve Champion Show Hunter Pony NPS area 4 – qualifying Northern Breeders Challenge & Roseberry Hunter Pony Finals, 1st & Reserve Champion – Royal Lancashire Spring Show and 1st & Champion – Royal Lancashire Spring Show, BEF 1st Premium Eventing Yearling.. 2009 Champion Light Horse 1st Hack / Riding Horse, and 1st NPS registered, NPS Area 4 Foal Show. 1st & Reserve Champion Hack, British National Foal Show. 1st & Reserve Champion 1st & Champion - Royal Lancashire Spring Show. Reserve Champion SHP - NPS Area 4 Spring Show. 2nd SHP Yearling - Cheshire County. 2nd SHP Yearling 2nd Riding Horse Yearling - North Of England. 1st Riding Horse Yearling, 3rd Roseberry Youngstock Final, 2nd SHP Yearling 153cm, 2nd Ottergayle Riding Horse Yearling - NPS Summer Champs. 1st Peekaboo SHP Youngstock Final, 2nd Cedarwood Youngstock Final, 3rd Sportshorse/Pony Youngstock, 2nd SHP Yearling, 3rd Riding Horse Yearling - Ponies UK Summer Champs. 1st & Reserve Champion Sports Pony, 2nd SHP Yearling - Scottish Horse Show. 1st & Reserve Champion SHP - Bucks County. 1st & Champion PP/SHP Of Great Britain, 1st & Reserve Champion Hack/Riding Horse, Supreme Champion In Hand, Reserve Supreme Of Show - Royal London 1st Yearling - Prestige Equine Events Autumn. National Showing Show (Aintree) - Hunter Pony Youngstock 1st & Champion, National Pony Society Summer Championships - Riding Horse Youngstock, Ottergayle Championships 2nd, National Pony Society Summer Championships -Competition Pony Youngstock 1st, & Champion, National Pony Society Summer Championships - Show Hunter Pony Colt 1st, National Pony Society Summer Championships - Roseberry Hunter Pony Finals, 1st and Champion Youngstock, Overall Champion, Pembroke County Show - Hunter Pony Youngstock - 1st and Champion, Scottish Horse Show - Riding Horse Youngstock 2nd, Scottish Horse Show - Performance Pony Youngstock 1st & Reserve Champion, Bucks County - Small Riding Horse Youngstock 1st & Reserve Champion. He is also the sire of Thursden Vallye Raphael Multi-Champion In-Hand and Ridden 14hh Sports Pony Stallion. Thursden Vallye Raphael Qualified for HOYS 2010 Cuddy In-hand Final, multi supreme champion ridden and in hand NPS stallion, BEF 1 st premium 07, 20 BD points competing elementary level - who in turn sired champion Pony Foal in Ireland at Cavan All Ireland Championships 2008. We consider Chester to be a superb Sire of quality competition horses and ponies. Many of his progeny have the potential to become FEI event ponies. Chester is not only a sire, but a sire of sires. "He is exceptionally good looking with a super temperament and expressive correct paces - a real quality little horse". List 1 judge Clive Halsall.